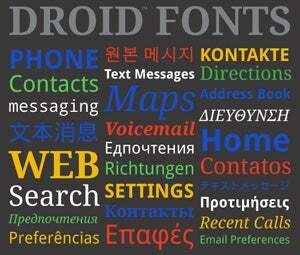 The Droid family of fonts consists of Droid Sans, Droid Sans Mono and Droid Serif. Each contains extensive character set coverage including Western Europe, Eastern/Central Europe, Baltic, Cyrillic, Greek and Turkish support. The Droid Sans regular font also includes support for Simplified and Traditional Chinese, Japanese and Korean support for the GB2312, Big 5, JIS 0208 and KSC 5601 character sets respectively. For carriers, developers and manufacturers, Ascender's also willing to bend, shape, twist and tweak the Droid fonts, throw in additional language support or whip a whole new set of typefaces to go along with Android.